Hogwarts Express carried 1 Millionth Guest Today! 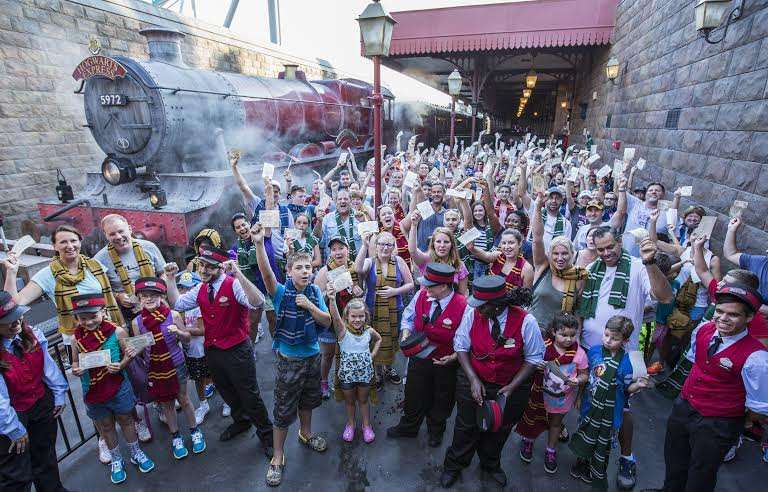 Universal Orlando celebrated a milestone today as the one millionth rider took a journey between Hogsmeade and King’s Cross Station on the newly opened Hogwarts Express. This ride, which connects Universal Studios Orlando and Islands Of Adventure showcases beloved charecters from the J.K. Rowling book series and movies. Guest who were on the breaking journey were met at Hogsmeade Station with cheers and complimentary Butterbeer ice-cream! In early July, guests began boarding the Hogwarts Express to travel between The Wizarding World of Harry Potter – Hogsmeade in Universal’s Islands of Adventure and The Wizarding World of Harry Potter – Diagon Alley in Universal Studios Florida. The incredible journey, which requires a park-to-park ticket, combines powerful storytelling, live special effects, lifelike animation and state-of-the-art technology to take riders on the journey of a lifetime. Previous Post Frozen Summer Fun Extended at Hollywood Studios! Next Post Celebrate World Elephant Day with Busch Gardens Tampa!